It can be trigged by something as trivial as a dispute between neighbours or a disagreement among family; an incident that, anywhere else, might be forgotten with the passage of time or left to the authorities to resolve. But in northern and central Albania, where an ancient code of conduct known as the kanun still regulates life for a large portion of the population, it can descend into a blood feud spanning generations and forcing entire families into confinement. Comprised of 12 books and 1,262 articles, the Kanun of Lekë Dukagjini, who is thought to have been a 15th century Albanian nobleman about whom little else is known, was passed down orally for centuries and only put into print at the beginning of the 20th century. First the Ottomans and then Albania’s communist dictator Enver Hoxha sought to outlaw it. But it continued to run parallel to state rule, governing everything from the economic organisation of households to notions of honour. However, it is for its authorisation of retaliation killings that it has become most notorious, particularly since enjoying a revival in the years following the fall of communism. Where once it sought to regulate such blood feuds – imposing limitations on who could be killed (no women or children under 16) – these aspects of the code have gradually been eroded, with the notion of vengeance overriding all others. 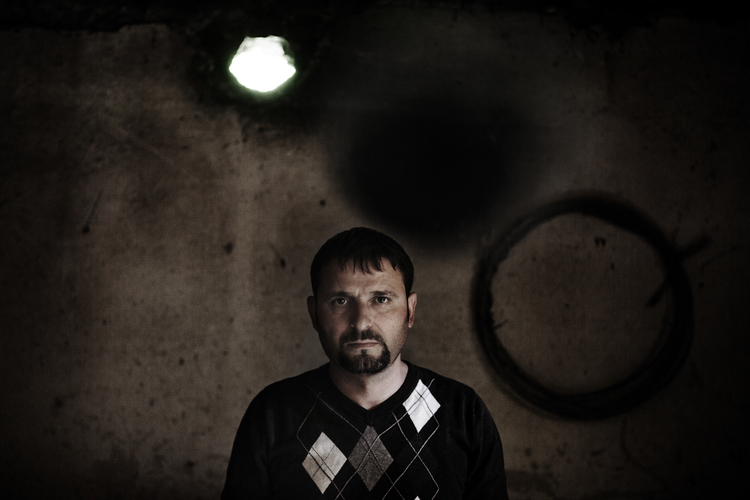 Basmir Gjeloshaj lost his father and two uncles to a feud in which two members of an opposing family were also killed. He was just six years old when his father’s life was claimed in 2001 and has seldom left his home since. The gjakmarrja, or blood feud, weighs heavily on Basmir and his family. He was only able to study to the fifth grade – and that with the assistance of a teacher who would come to his home to give him lessons. His younger sister, Drenica, was a little luckier. She was able to leave the house to attend school. But then, one day when she was in the fifth grade, a car sped up behind her and offered her money to get in. Fearing it was part of an attempt to kill her, she too retreated inside. Like many Albanians in their position, the Gjeloshajs hoped that they might be able to outrun the feud – by fleeing the country and starting anew somewhere far away. And when, in 2012, Sweden accepted their claim for asylum, it looked as though they might have succeeded. But their new lives didn’t last long. In December 2013, the Swedish government expelled them on the basis that their expatriation papers, supplied by Albania’s Committee of National Reconciliation, a body set up to counter the kanun, were counterfeit. “When in Sweden, I used to go to school, talk with the other students and make friends,” explains Drenica. “I did not go out that much, but felt freer.” Basmir was also able to study in Sweden and had aspirations of becoming a mechanic, getting married and starting a family. Now back in Albania, the 19-year-old spends most of his laying on a bed that is too small for his more than six foot frame. It is, his mother File says, “like being dead once again”. Fifty-year-old Mhili Zefi lives in isolation in his decaying home in the Shkodër suburbs. His house faces a disused railway and is so cold that his breath forms small clouds in the air. Pictures of his daughter’s wedding and images of Jesus and the Virgin Mary serve as the sole form of decoration for its bare walls. Mhili inherited a feud from his father 20 years ago. That is close to being resolved thanks to rulings imposed by a council of elders and the intervention of a peacemaker, Nik Zefi. Sixty years ago, when Nik was just 15, a blood feud forced him inside for 10 years. It is that experience that has inspired him to help others in a similar position. But even once Mhili’s 20-year feud comes to an end, he may not be able to leave his home. For now, that burden falls upon Mhili’s wife, who works two shifts a day in order to keep all four families afloat. Her husband lives in hiding – allowed out only for an hour every now and again as a result of a besa, an agreement with the injured party that grants him temporary freedom – and even if he didn’t, nobody would hire a man with a gjakmarrja sentence hanging over him. Gjion Mhilli is also paying for a crime he did not commit. He will forever remember the date September 19, 1992 as the day his brother shot and killed a neighbour in a dispute over land. On the few occasions that Gjion has ventured outside since, he has been threatened or chased, often having to hide in the store rooms of sympathetic shopkeepers. Of their three children, only 15-year-old David is able to read and write. Twelve-year-old Yussef has never been to school and although illiterate can speak English perfectly. At just seven, Gjonna understands little of why her family lives as it does. Gjion’s fingers are stained yellow from chain smoking and the television, his only company during the day, is permanently on. “Should I be sure my children would be spared, I’d kill myself right now,” he says, shaking his head. As such blood feuds engulf different generations of the same family, they create, according to Milva Ekonomi, Albania’s deputy minister for health, “a deeper generational gap … as children have access to social networks and suffer more, while their parents are completely cut off from society and from virtual reality”. Often, the urge for revenge is nursed in the shadow of the individual’s conscience. Thirty-two-year-old Gega Murj, whose older brother was killed by his uncle and cousin, explains: “Should I meet them in the street, I don’t know how I would react.” His father, Marko, does not want any further bloodshed but fears he will not always be able to control Gega. Seventy-year-old Maria Chosaj says that her family is not looking for revenge for the murder of her son. Despite this, she has never accepted an offer of peace from the family of her son’s killer, and in her refusal to do so she is bequeathing a heavy burden to her grandchildren. The eyes of the eldest, Kujtim, are etched with pain over the loss of his father. But reconciliation is possible and, when it happens, often takes place at Shkodër’s Catholic Cathedral, where a kiss between opposing sides seals a peace lasting generations. “Should the government let laws be applied and respected, people would not take the law into their own hands, explains Angelo Massafra, the bishop of Shkodër. “The kanun rules call for reconciliation,” he adds, criticising its misrepresentation. In fact, the kanun offers three ways to avenge murder: by paying money to the family of the deceased, by securing the forgiveness of the church or by killing the murderer. But as Albania transitioned from communism, a frail state and widespread judicial corruption saw more people turn to the kanun and its most extreme interpretations. The government has responded by increasing the prison sentence for murder to 15 years to life, but well-off murderers who can afford to pay the judge often see their sentences reduced. According to unofficial reports, a little over $6,000 will secure a year’s reduction. “Increasing penalties is not enough. We also need ‘clean hands’ here in Albania in order to reform our corrupted justice system and to make the judge do his job,” explains Milva Ekonomi. The priest shares another story about a friend of his, whose father had been killed. One day when this friend was playing football in the street, he got into a fight with another player over whether or not a goal should have been allowed. The other player mocked him for being willing to fight over such a thing but not brave enough to avenge his father’s murder. In order to avoid becoming a murderer himself, he jumped aboard the first raft heading to Italy. Meanwhile, those, like the Gjeloshaj family, who stay behind, brick up their windows and build tall walls around their homes, retreating further into their personal prisons as they hope that the cycle of bloodletting will come to an end.